For this kitchen unpack and organize the client had recently moved and was not sure about where in her kitchen to place certain items. Their family loved to cook and had lots of spices. We started by clearing a cabinet and gathering the spices from the various places they had ended up in the unpacking process. Now, they were all right by the stove where they would be a hand’s grab away! In my excitement to get started I failed to grab a before picture! The bottom right shelf was designated for all the spices that were used most often. The middle shelf on the right side had baking items in the back and sugars for coffee in the front. On the top shelf the bulk and overflow spices found a place. All of the bulk spices that were in bags were put in airtight containers and labeled. Having them in containers not only extends shelf life but also maintains a cleaner look and maximizes space because they can be stacked. After the spices were finished we moved on to the cabinets establishing the best place for each grouping of dishes. Here is one of the cabinets that had some of the dishes for baking but not all of them. 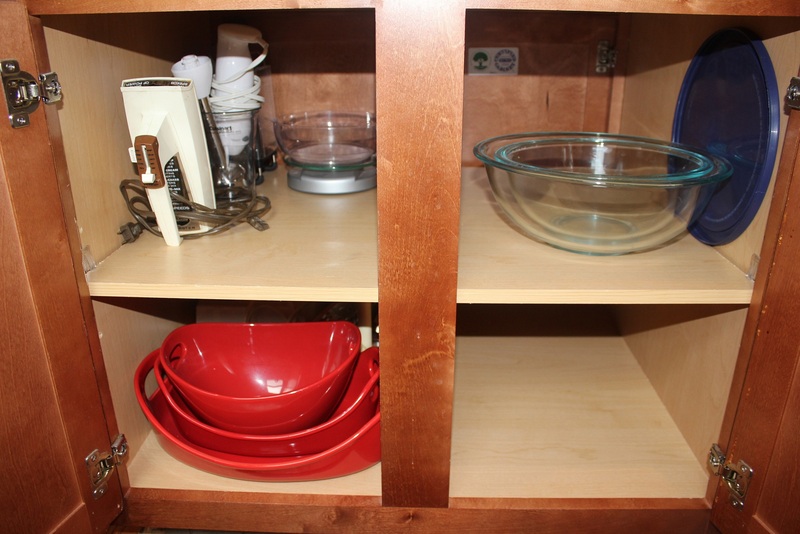 All the baking dishes, liquid measuring cups, and mixing bowls were rounded up and added to this cabinet. Lids were placed underneath or to the side of the dishes they belonged with. A designated place for like items is also helpful for putting away and maintaining organization, not only finding them! In the baking cabinet we used up every bit of space that we could! The following before picture you can see that it had tupperware and a salad shooter that headed off to their place, leaving room for baking overflow and then some, after! This client still had some unpacking to do so the extra space was a welcome sight! All in all, another great day of unpacking and organizing kitchen cabinets!! Posted on June 25, 2014 by shawnachildersPosted in KitchensTagged baking, kitchen, organizing cabinets, professional organizer, spices.